Album Info: Trains in throughout Missouri, KCS Southern Belles, Trip Home to SEMO, Visit to the BNSF Transcon around WB Jct., Kansas City Rails, Trip to SEMO and Illinois, and more! Description: The GEVO DPU pushes around the curve past a Southern Belle getting ready to head north. 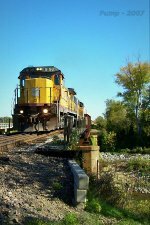 Description: I finally caught a Southern Belle SD70ACe leading in good light and in a decent location. Kevin got a nice reflection shot just to the right of this fine Retro Belle ACe over a cattle farm pond. Description: The NS Locomotives and the first UP came in with UP Train QSRAS 01. They cut off their train and pulled into the siding to pick up the 2 other UP units and the LLPX with the short UP Train MNLAS 02. They will continue on from here as one train to the same destination. Description: This was a neat find, now in tie service. Description: The units on the left were last assigned to UP Train LSI55 02, while the units on the right were last on UP Train LSV03 02. Description: This unit started out in almost the same paint scheme as RI 4349 31 years ago in 11-1976 with a Builder's Number of 757136-35. They were last assigned to UP Train LSI55 02 on Friday. Description: Headed past Ash Hill was UP Train QSRAS 01 after it picked up UP Train MNLAS 02 at Junland. You might notice the soda bottle balancing on one of 9297's grab irons. Description: Several of these DRGW 50 Ton Hoppers were in the train loaded with coal. Description: We found a B40-8 leading a double stack with UP Train ZMXYC 01 at the UP North Dexter Crew Change Point. Nice to be in the area when the fall colors were beginning to show. Description: Sitting parked north of the UP North Dexter Crew Change Point was UP Train MBHPB 03 with GE power. Description: This Eagle Over Buzzsaw MP Logo looks great on the side of this box car, nearly 25 years after the UP-MP Merger. Description: The gates go down at Stoddard County ZZ Highway as GECX 8548 activated the crossing. Description: That nifty GMTX unit is still here this evening, ready to go out on Monday's local. It is assigned to the LSI55. Description: The Old GRS Signal Relay Cabinets sit next to the De Soto Sub. while dwarfs guard the line. The Butler County Courthouse is seen above the buildings to the left. Description: The MP Signals at MP 165.48 on the UP De Soto Sub. guard the line to St. Louis at Vine Street with an approach indication. Description: This unit was added to the front of UP Train AARAS 01 seen in the background. 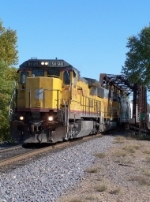 Description: These were some of the last SD70M's with a metal builder's plate. Description: Sitting in Junland Siding was UP Train AARAS 01 with 2 SD40-2's for power. Description: I think this unit is ready for a repaint. 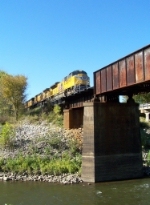 Description: Heading over the bridge at Fisk was UP Train MNLTT 04 as it crossed from Butler County into Stoddard County, MO. The last unit was UP 9765, which I shot pictures of on 9-12-04 when it was still a Patched CNW Locomotive. Description: Headed through PB was UP Train MASNL 03 as it crossed yet another bridge today. Description: This was the first example of a Rio Grande Heritage Hopper that I've seen. It was sporting two DRGW logos on the MASNL 03 today. Description: Close to sunset we observe BN Executive Painted SD70MAC's taking BNSF Train C NAMPAM3 29 down the hill alongside fields and US Highway 60. Description: The DPU's shove at sunset towards Arkansas down the Thayer Sub. Description: Heading out of Ives Siding was UP Train MASNL 03 headed into Butler County, MO from Stoddard County. Even in 2007, these units were both still wearing their late 80s factory paint jobs. Description: Coming past the Control Point at South Ives was UP Train ZMXDT 02 on the main as UP Train MASNL 03 sat in the siding. Description: The DPU's of a northbound are seen at the south end of Drexel Siding. Description: The DPU rounds the curve headed southbound. Description: The front end of the northbound seen earlier leaves Drexel Siding at sunset after getting its train together. I gave the conductor a ride to the head end. Description: The KCPL La Cygne, KS is just into its return journey to Wyoming to get another load of coal. Description: What railroad is this? BNSF Power meets on the KCS at South Drexel. 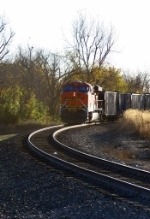 Description: Here's a shot of a standard Wisconsin Southern Box Car. Description: One of the 9-11 cars was also in the train. Description: As the train stopped, I looked up and saw the MR Celebrating 70 Years Car! Didn't expect that! Description: The Southwest Chief with 9 cars comes past the stopped train at a full track speed of 90 mph. Description: About 6 seconds later, Amtrak is well on its way towards Chicago. Description: I knew this unit was here, so here's another look at ex-DRGW 5904 GP9, now the grain elevator switcher here at Carrollton.